Arizona-based provider of customer community software and services reports a strong 2015 driven by increased demand for customer engagement technology and expertise in building and leveraging customer communities. “Areas like Phoenix, Tempe, and Scottsdale, are rich with some of the smartest people in the country. We’ve positioned the company centrally in Phoenix’s East Valley to make it easy for top talent to join the Socious team as we continue to grow." Cloud-based online community software company, Socious, began 2016 by opening a new 10,000 sq. ft. headquarters office in Mesa, Arizona. Over the past 6 years, the leading provider of community software has averaged 24% revenue growth per year. Through its social community software and services, Socious helps some of the top companies and nonprofits in the world manage relationships with over 1.5 million customers – an increase of 50% since the beginning of the 2015. Socious experienced a significant expansion of its community management, event management, and technical services in 2015. Socious is the only online community software company to provide both an industry-leading platform and a full stable of specialists to design, implement, and grow their customers’ online communities. “Socious is able to take many of the risks out of launching an online community. Socious’s hands-on experts alleviate all of the major concerns involved in this type of customer engagement – from who is going to manage the community to how do we get people to use it,” said Paul Schneider, CEO and co-founder of Socious. “In addition to our software platform, businesses and member-based organizations are coming to us for services ranging from event and community management to strategy development and technical services – important areas that they would be left to figure out by themselves if they didn’t work with Socious,” Schneider continued. To handle increasing demand, Socious invested in its software development, professional services, and marketing teams over the past year. 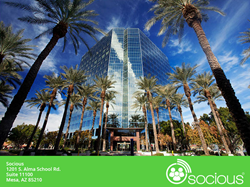 At the beginning of January, Socious opened its new headquarters office on the 11th floor of the famous “old Bank of America” building in the heart of Mesa. “Areas like Phoenix, Tempe, and Scottsdale, are rich with some of the smartest people in the country. We’ve positioned the company centrally in Phoenix’s East Valley to make it easy for top talent to join the Socious team as we continue to grow,” explained Schneider. Socious was also named one of the top ten software companies in the Phoenix area by the Phoenix Business Journal. Socious expects continued growth in software and services revenue in 2016 as companies increasingly make ongoing customer engagement a top priority. Founded in 2002, Socious (socious.com) offers the industry’s most complete online customer community software to businesses, user groups, and associations. The Socious platform manages over 1.5 million customers for many of the world’s top companies and membership organizations. Socious’s peer-to-peer community software includes private social networking, customer communication tools, discussion forums, membership management, and collaboration tools to help organizations increase sales, retention, and customer engagement. Socious provides a full range of professional services to help organizations plan, launch, and manage their online customer community. Take an online tour of Socious online community software.